Sylvia’s story introduces us to the Boxfields area. within the Box Parish for many generations. All photos courtesy Lucas family, unless stated otherwise. 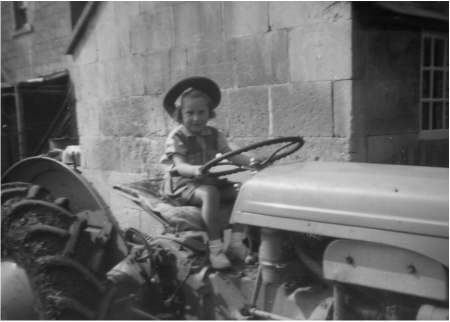 I moved into my house in Boxfields 54 years ago when I married my husband, John Lucas at St Nicholas church in Bathampton in 1960, as my family are from Bath. I have lived in the same house ever since but so much has changed, not least the removal of an entire prefab housing estate and shops, that it is like living in a completely different area. John and me at St Nicholas Church in Bathampton on our wedding day. When I first moved in we were on the outskirts of Box village but close to a lot of other people. Our row of houses was built some time not long after the construction of Box Tunnel, completed in 1841. The Boxfields area had over two hundred bungalows, many of which were next to our row on Boxfields Road. These were separated into two estates. There were more than a hundred flat roof buildings on one side of the road and, on the other, even more pitch-roofed prefabs. They were built as temporary accommodation for families who were homeless because no building was being done during the war. Single people were housed in hostels at Thornypits and Westwells. We believe there were also more prefabs at Westwells and a cinema at Thornypits. The shops here in the 1950s and 1960s were a godsend. They were right next to Boxfield Road, in at a gate which was the entrance to the prefabs. The shops were just on the right. They were built specifically for the prefabs. John's sister, Nancy Milinowski (first husband Lavender, and nee Lucas) worked in the grocers. There was a grocers, haberdashers, Poole's fish and chip shop, and a community centre. Further along was Webbs, which started as a mobile shop and later changed to become a self-service supermarket. Marta Milanowski with the Boxfields prefab shops behind her. There was a school on White Ennox Lane called Box Highlands School, which has now moved to Corsham Broadwood school up at Rudloe. My children both went to Box Highlands. The headteacher was Mrs Starosta. It continued right up to 1984. There were very few houses up at Rudloe in the 1960s, none of the houses along Leafy Lane existed then. They are all 1970s built. Most of the people from Boxfields' prefabs were re-housed and they went to Rudloe. There wasn't a church at Boxfields but we had the Methodist Chapel in Box Hill, opposite the Quarryman's Arms. I used to be the Sunday School teacher there. In about 1956 it all moved down to the centre of the village and the Chapel became residential accommodation. It was quite a to-do because we consider Box Hill to be a separate community to Box itself. John always thought of himself as Box Hill and he didn't join any of the clubs down there. 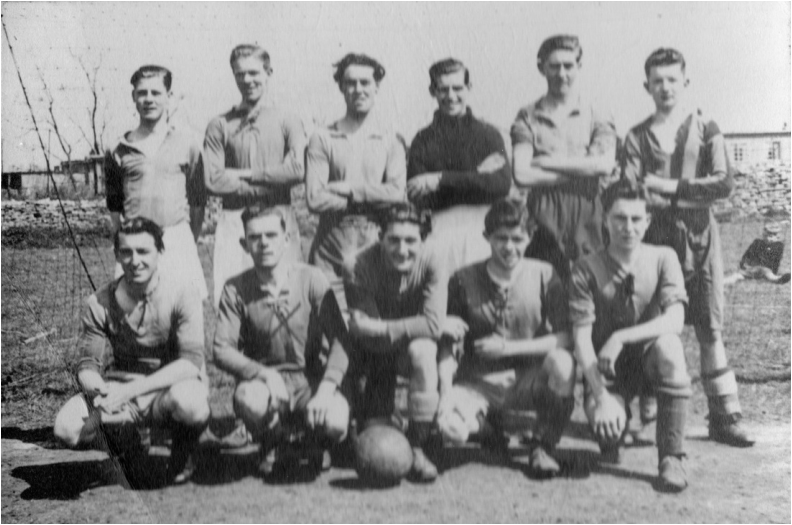 Box Hill Football Club used to meet in the field next to our houses. They used our water and electricity, running a lead round to the side of our house into a gate, which led to their pitch. John played in the team, as did Mervyn Clutterbuck who still lives in our row. John lived here all his life; born here and died here. His parents lived here from the 1920s. When I moved in, our road was a mud track originally until we clubbed together to have it tarmac’d in about 1964. When the children were in a pram, I put newspaper down to clean the wheels which were absolutely caked in mud. That's how it was and you didn't take any notice of it. We never had indoor toilets. 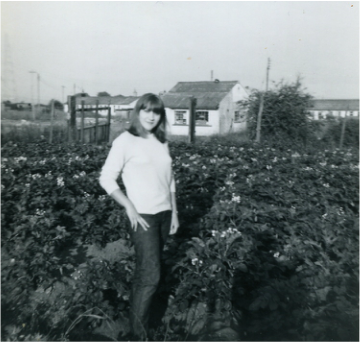 We used to go up the garden by the allotment belonging to number 1 and there was a rank of toilets there, one for each cottage. I didn't like it and I always took my dog with me. We had running water (cold only), no heating system, a twin-tub washing machine. There was a pony called Joey, kept by the family, on the land which is now a garden, opposite number 8. I’ve been told it went to the market in Bath with a trap, to sell the eggs laid by John’s parents’ chickens. In John's parents’ time the little cottage had been extended by acquiring the next door cottage in the rank (which is now the dining room) and later we bought half of the house next to that (my kitchen). The row of houses was originally nine residences and is now six. You can still see where the old front doors used to be on many of the merged properties. Like many rural places, our house had a bread oven where the garage now is. The cottage was a bit run down when I moved in. The first thing we did was to float a new concrete floor in the dining room. There were planks everywhere to walk on. John did most of the work. He was a painter and decorator by trade but he could put his hand to anything electrical, plumbing or plasterwork. John's mother and father were renting the cottage before it became ours, and the whole row and field behind the row belonged to Fred Neate who lived in Hillcrest at Box Hill. I moved into my mother-in-law's cottage to look after her but she didn't last the year. In about 1969 Mr Neate offered us the opportunity to buy the whole rank, but we just didn't have the money to buy seven houses! John said we wouldn't buy our house unless we could have a 12 foot strip of land from the field out the back. There were very few windows on that side of the house as was common in old properties such as ours, and many of us in the row wanted to add windows and have the access to clean them. Mr Neate said we were sitting tenants and he wanted to do a deal, so he sold us the land. John's grandfather, Joshua Lucas, was a Box person, who worked as a labourer most of his life and rented accommodation at Mill Cottages, the Market Place and at Saltbox Cottage. John's father, John senior, was born in Box and married Martha Sarah Sartain from Bath. John senior joined the Royal Marine Artillery as a Gunner in 1899 and was discharged in 1930 after just over 30 years’ service. They lived much of their lives in Portsmouth and moved back to Box following his discharge. John and Martha kept goats and John junior (Sylvia’s husband) used to tether them on Box Hill common on his way to Box School and bring them back in the evening. They also kept chickens in the field behind the houses and sold the eggs in Bath. They had five children: Kathleen known as Kit; Dorothy; Florence Elizabeth, known as Floss; Annie Louisa, known as Nancy; and John junior. Dorothy married Sid Fletcher and they lived in Bargates. Dorothy still lives there now. Sid may be remembered by many as he, with Tommy Osbourne, was one of the two Box postmen for a time. Floss married Ted Barnett, who may have been a stone mason from Box Hill. They lived at Kingsdown then later moved to Queen's Square. They had no children. Floss remembers a German plane that crashed near Kingsdown. My husband John used to play in the craters left by bombs. John used to tell of the air raid searchlights positioned up on Box Hill and Box Fields to protect Colerne. Some were roughly where Woodland Adventurers is now, by the crossroads Tunnel Inn sits on. Kit married Bill Webster (whose parents we believe lived at Pye Corner). Kit and Bill lived in Barn Piece. Before that Kit lived down Love Lane in Box Hill. Kit was the dinner lady at Box school for many years and Bill the caretaker. They had 3 children: Johnny, Mary and David. Johnny was married in Box Church. 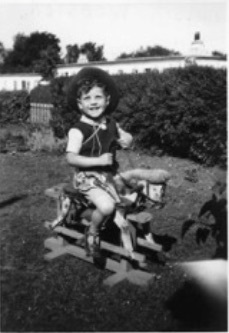 Kit’s son David on a rocking horse believed to have been made by my husband John. 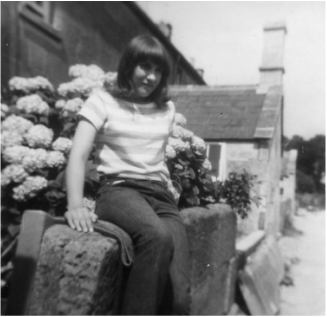 This photo was taken in the garden of one of the Boxfields prefabs. 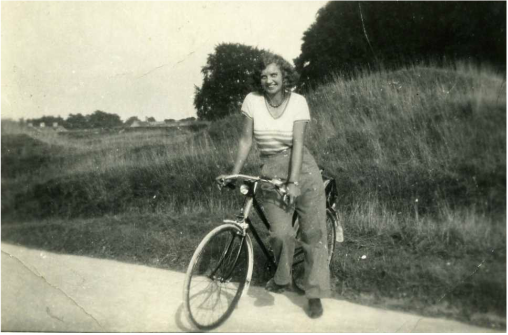 Nancy lived in a cottage by Box Hill common and then moved to number 4 in our row of houses with her second husband. My daughter remembers clearly Nancy skinning rabbits to eat outside our house and wondering why she had to do it outside ours and not outside theirs! Nancy married twice, first to John Lavender who was killed working at Spring Quarry. They had four children; David, Bill, Bob and Kath. Her second marriage was to Frank Milinowski and they had a child, Marta. John Lucas (my husband) married me (Sylvia Smith). We have two children; Rosemary and Andrew, who both still live at Boxfields and Box Hill, five grandchildren and one great grandchild. We are all still local to Boxfields. John kept pigs in the field behind the house in partnership with his brother-in-law, Sid Fletcher. The pigs were ok but I remember Jacko, the boar, used to charge for food whenever he heard the bucket being shaken. I have worked and been involved in village life both up at Boxfields and Box Hill and in the village. Aside from voluntary work as a Sunday School teacher, I worked for Bests the Builders, who owned the Vine Court site after taking over from Merretts. Alongside my good friend Rita Hall who lived in our row, I was an Avon representative for all of Box from the early 1980s, being promoted to a manager before retirement. I am still an active and proud member of the Box Bowls Club. Joshua Lucas (1857 - 1931) was born in Corsham and married Sarah Elizabeth Sperring (b 1849) in October 1877. Joshua worked as a labourer all his life: in 1911 as a Picker in the Stone Quarry; in 1901 as a Hawker to General Labourer; and earlier as a labourer. They rented accommodation in various places in Box: 1911 at Saltbox Cottages; 1901 at The Parade (sharing with 4 lodgers); and in 1891 at 4 Mill Cottages. They had four children: John (b 1881); Thomas (b 1883); Henry (b 1886); and Eliza (b 1889). John Lucas (b 3 March 1880) married Martha Sarah Sartain (b 1888) from Bath. Children: Kathleen; Dorothy; Florence Elizabeth (b 1911); Annie Louisa (aka Nancy) (b 1910) and John. John joined the Royal Marine Artillery as a Gunner on 5 June 1899. In 1911 John and Martha lived at Eastry, Portsmouth. John Lucas (my husband) married me (Sylvia Smith). We have two children: Rosemary and Andrew.